Miniature Labrador retrievers, or mini Labs, are one type of dog that always attracts controversy. Some claim that this breed of dog is simply a smaller sized variation of the Labrador breed. That it is a pure bred type of Lab in its own right, bred specially for those who chose to work with a smaller dog, or by those who preferred a smaller type of Labrador. Others believe that there is no such dog breed and also claim that mini Labs are merely the product of selective breeding between two undersized parents. Worse still, these critics also insist that by deliberately creating smaller dogs breeders are adding to the breed's notable eye, bone and hip problems. The whole controversy is also blurred by cross breeds such as the Labradoodle, a cross between a Lab and a Poodle, and the Comfort Golden, a Labrador Retriever and Cocker Spaniel cross-breed. Both the Laradoodle and the Comfort Golden are smaller than the standard Labrador, but are not to be confused with mini Labs. Full size breeds of Labrador are 21 ½ to 22 inches at the withers, whereas mini Labs are up to six inches smaller. 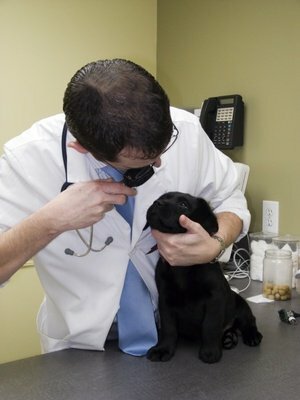 Other than the difference in size, there are few if any differences between mini Labs and their regular size counterparts in look and temperament. Like full sized Labradors, mini Labs have the same colour of fur, be it yellow, chocolate or black. They are also excellent family dogs, being loving and even tempered. They are ideal for people with limited space in the house or with a small yard and garden. They also share the same skills as a working dog as those by breeds of full sized Labradors. No matter what your view is on whether miniature Labrador retrievers are a legitimate breed of Labrador in its own right, they still make wonderful pets and working dogs.